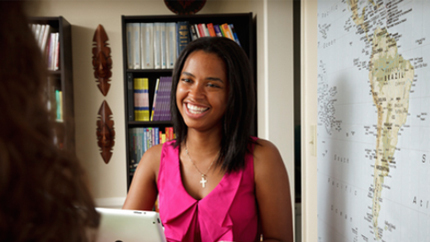 Meet Tiara Willis — a globetrotting young activist, aspiring Foreign Service Officer, Benjamin A. Gilman International Scholarship recipient to the United Arab Emirates in 2014, and one of three grand prize winners of the Bureau of Education and Cultural Affairs’ Citizen Diplomacy Challenge. Since returning from her program, Tiara has become a true study abroad spokesperson. Through her established social media presence, she consistently shares dynamic photos of her exchange and has provided information about opportunities for study abroad. During the three month timeframe of the Citizen Diplomacy Challenge, she spoke to ten separate classrooms about her experience overseas, and used opportunities like the National Education of Women’s Leadership Conference for Women in Politics as a platform to speak on the impact of her own exchange experience. Tiara also connected with other alumni, introducing her Haitian and Gregorian friends to cuisine from her exchange, as well as introducing a Mongolian student to an American delicacy — s’mores! Tiara has demonstrated continued commitment to diplomacy and public service. She’s currently completing an internship with the International Rescue Committee (IRC) and will serve as a Peace Corps Volunteer in Nicaragua for Entrepreneurship Education starting in March 2016 while earning her master’s degree. Her career interest is in international advocacy, particularly in Africa and she dreams of one day joining the Foreign Service.